I volunteer with my local emergency services organization. For several weeks I have been preparing full time for a huge, multi-state disaster exercise. This work has taken time away from my writing, but I feel I am contributing to the community by doing it. The volunteer activity also contributes to my writing by enhancing my ability to tell stories containing disasters. I recommend you also volunteer to help your community. Not only will your community benefit, you too will benefit. 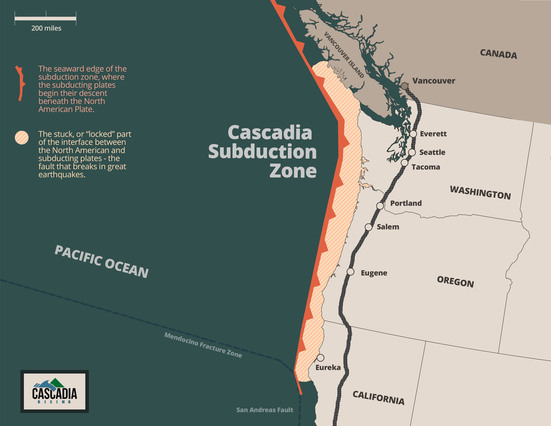 The Cascadia Subduction Zone off the coast of North America spans from southern British Columbia to northern California and can produce earthquakes as large as magnitude 9 with accompanying tsunamis.